OLYMPIA—Thousands of secretaries, bus drivers and other school workers have joined the Service Employees International Union, creating the state's largest labor union, officials say. The Public School Employees of Washington, which represents about 26,000 school workers, said delegates voted overwhelmingly in favor of joining the SEIU during a special conference last weekend. Officials from the newly merged unions said their top issues during the 2006 Legislature will include school worker pay raises and education funding, along with efforts to win collective bargaining rights for child care providers. "Our members are really excited about the strength and about the numbers they gain through this affiliation," school employees union spokesperson Rick Chisa said. Adding the school workers brings to about 100,000 the number of workers represented by SEIU in Washington state, union officials said. That tops the estimated 78,000 teachers and other education workers represented by the Washington Education Association, an affiliate of the National Education Association. The SEIU has actively recruited new members in recent years in Washington, including a successful drive to unionize some 26,000 in-home health care workers in 2001. "In terms of the whole question of who's growing and who isn't growing, it adds numbers to their claim that they're a growing union and are becoming a more powerful union," said Peter Kardas, director of the Labor Education and Research Center at The Evergreen State College. Such recruitment efforts are part of SEIU's participation in the "Change to Win Coalition," a group of leading unions that severed ties with the powerhouse AFL-CIO this summer. 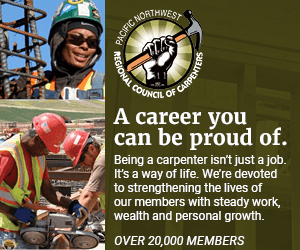 The national rift has cut state-level affiliations between SEIU members and the AFL-CIO's Washington State Labor Council. But leaders from the two factions recently designed ways for local and state organizations to rebuild their ties, and the council hopes SEIU members will return to the fold. "In terms of volunteers for events or political action, they have always been one of the top unions, so it was a big loss," council spokesperson David Groves said. Kim Cook, president of the SEIU's Local 925, said the state organization hasn't decided whether to re-establish links with the AFL-CIO. "Even if we're not in the organization, we share the same goals and values and we're going to be working alongside them," Cook said. The new affiliation throws into question a long-standing but unofficial "no-raid" agreement between the Public School Employees and the Education Association, which represents about 12,500 of the state's so-called "classified staff." Charles Hasse, the WEA president, said officials from his union plan to meet with SEIU and Public School Employees officials in Washington, D.C., to discuss such territory issues. "We do have a solid record of working well with SEIU in Washington state and recognize the value of that," Hasse said.